If a drone buzzing over your property is making you mad, you don’t have to take it. According to advice the Albany City Council got Monday, you can call the cops and ask them to investigate. Councilwoman Bessie Johnson had heard from a couple living in the Deerfield area of southeast Albany. 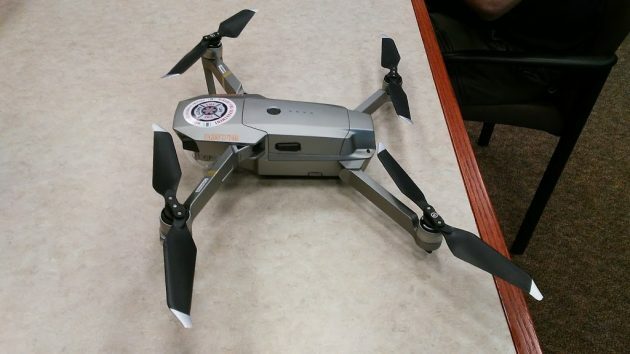 Apparently somebody had been sending a drone over or near their property, upsetting their dogs, and the police told them there was nothing that could be done. But there is, Assistant City Attorney Joseph Allison told the council. While the legislature has preempted the field of drone regulation, keeping cities from making additional rules, Oregon has laws prohibiting drone operations that annoy people on the ground, or that are reckless. Another state law prohibits an invasion of personal privacy. Allison told the council that police could cite drone operators under those statutes. As the city’s prosecutor, he’ll talk to the APD about additional training on the subject of drones and the law. Chuck Perino, Albany’s city emergency manager and safety officer, briefed the council on Albany’s policy on operating city-owned drones. No video of persons or anything that could be an intrusion on people’s privacy is allowed. Employees trained as drone pilots sometimes use the unmanned aerial vehicles as part of their city work. As you can see in the video above, Perino brought along one of the city’s drones, and for a few seconds he flew it in the council chambers. A drone used by the Albany Fire Department sits in the council chambers Monday. Ooooh! Show and tell @ City Hall. Perhaps a tour of ADUs is next. Once again, State overreach prevents City Moms and pops from piling-on additional layers of regulatory nonsense. This is a sort-of inverse of the square footage limitations on ADUs. The City seems to grind it’s teeth over drone-land and the Coppers say “there’s nothing to be done about illicit drone ops,” even as there are numerous State statutes. Left hand-Right hand ignoring one another. Nothing new here. Perhaps someone over at the County could intercede. LOL … and no love for the cute brunette next door? This fascination with drones is a distraction. Best check the Konopa Klan’s plans for facial and license-plate recognition software. You’ll soon wish it was just a few drones. Downtown Albany will be like London in one respect. Full CCTV camera coverage. Perhaps a local drone owner can perform a test study and follow Konopa for a month (not within 80 feet of course) and broadcast the footage publically on youtube. Advocating for drone technology deployment publically without an in-depth and comprehensive understanding of it is very unwise. Drone operators, stay 80’ above roof tops in residential areas. If neighbors complain, they can call the FAA. If they are just curious, take a picture and show them that there is nothing private that can reasonably be complained about at that height. Just fly high and safe, please. Realestate photographers will use drones for circular view of the property they are paid to photograph. They are unlikely going to invade anyones privacy and interrupt their bread and butter. But they will not be found hovering around windows or focused in one spot for very long.